Shadow Boxes are used for three-dimensional pieces, displaying objects as small as miniature hand-carvings, to something as hefty as a sports jersey. How large the object is will determine what type of moulding is available to frame it. Larger items will need a ‘deeper’ frame, to be able to situate the object between the backing and the glass. Framagraphic has a number of deep mouldings to choose from. 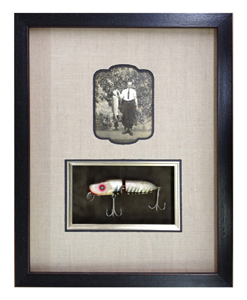 With any shadow box, some consideration should be made as to how you would like to display the frame. Smaller boxes can be hung traditionally on a wall, but for very deep frames we suggest sitting them on a shelf or mantelpiece. We’ve framed everything from baby shoes to canoe paddles!